The fruitiest and juiciest of the Artist Collection. If we had to describe Samba Sun in one word, we'd use the word 'refreshing'. You'll notice clementine the most, with peaches and apricots backing it up, and a hint of fluffy marshmallow, although this is more subtle than the fruit ingredients. Another great flavor from this best-selling range of vape juice. For the creation of the Artist Collection, NJOY went out and found the best vape mixologists in the world and asked them to produce one outstanding flavor each. 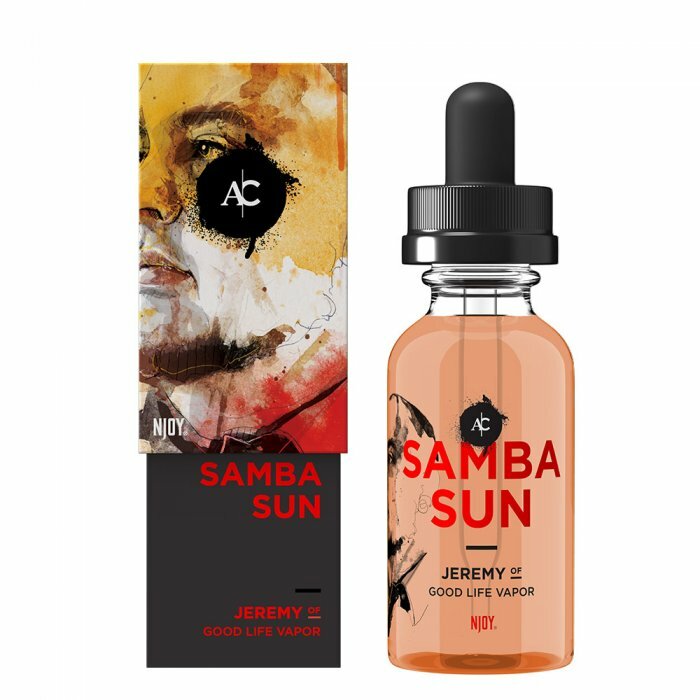 Samba Sun was created by Jeremy Dollar, CEO of Good Life Vapor, a Georgia-based liquids manufacturer. was looking forward to this, but was disappointed. for me, apricot is the top note, followed by peach, both of which i enjoyed. however the bottom note of marshmallow was almost a burnt flavor. i ended up giving it away to a friend, who liked it. Not at all what I expected. Very strong taste and not completely enjoyable for me. Very smoky taste, which is what I am trying to get away from! I have gone through 3 bottles of this. it tastes great! Very peachy. I liked it. Quality service as always from ET. package arrived promptly without a hitch. On to the juice. I have tried many other "premium ejuices before" some have been good. some ok. and some great. This is without a doubt great. The inhale has a fresh/bright citrus note of clementine. It then transitions to a creamy marshmallow. and settles on a juicy peach. This juice has layers that truly meld together to create a wonderful vaping experience.